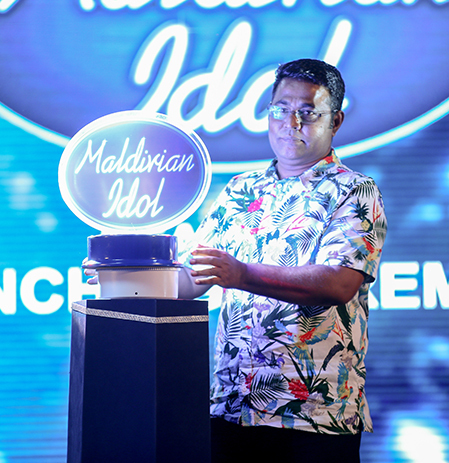 Popular reality show Maldivian Idol on Saturday launched its second season. Maldivian Idol is the country’s first franchise reality show, and it is hosted by Public Service Media (PSM). Auditions for the second season are now open with the official launching held Saturday evening at Dharubaaruge Convention Centre. Speaking after officially launching season two of the show, Chairman of PSM Ibrahim Umar Manik highlighted the success of season one, and said “it was testament to the capabilities and determination of the PSM team, despite a shortage of modern resources.” He further expressed hope that the second season would be even more successful. The idol project is headed by Deputy Managing Director of PSM Aminath Shaayan Shahid. Speaking at the function, she noted the efforts being made to make the season two a greater success. The ceremony saw the unveiling of judges and hosts for the new season. The selections were made by Fremantle Media Group, through open auditions. The judges of season two will be Mariyam Unoosha and Ibrahim Zaid Ali, who also judged the first season, in addition to famed artist Ismail Affan. Moosa Waseem, who also hosted the first season, will be joined by singer Aminath Lamha Latheef as his co-presenter. Locations for the Maldivian Idol season 2 were also announced last night. They are; Malé City, Addu City, Fuvahmulah City, Gan of Laamu Atoll, Eydhafushi of Baa Atoll and Kulhudhuffushi Island of Haa Dhaalu Atoll.